Today I "cleaned" the craft room up enough to quilt. (By which I mean I mostly moved stuff onto my paper crafting table which is now overflowing.) I then took advantage of all this glorious space by starting in on a quilt. (Hurrah!) It has been literally years since I last quilted and I've missed it so. 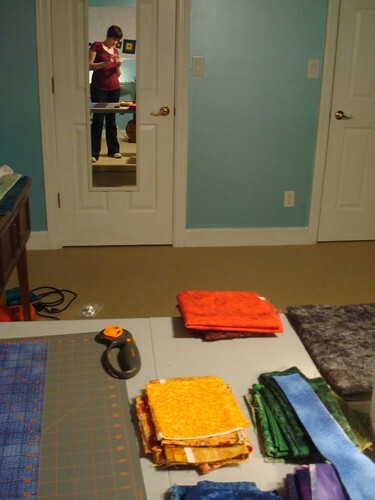 But the quilt that is coming together is not the only work in progress this photo depicts. There is also the clean(er) craft room. My new wardrobe. And, always, always, myself. I'm learning how to do things on my own terms, in ways that make me happy regardless of what "everyone else" might say or think. And that is progress in it's own right.